THANKS to Brexit and the election of Donald Trump, 2016 is widely viewed as a political turning-point. But it may also come to be seen as an economic turning-point, marking the third big change of direction since the second world war. The post-war period from 1945 to 1973 was the era of the Bretton Woods system of fixed exchange rates and capital controls. It was a time of rapid economic growth in the rich world as countries rebuilt themselves after the war and as the technological innovations of the first half of the 20th century—cars, televisions, and so on—came into widespread use. High taxes reduced inequality; fiscal policy was used to control the economic cycle. It all came crashing down in the early 1970s as the fixed-currency system collapsed, and an oil embargo imposed by Arab producers ushered in stagflation (ie, high unemployment combined with inflation). By the early 1980s, a new system had emerged. Currencies floated, capital controls were abolished, the financial sector was liberalised, industry was privatised and tax rates on higher incomes were cut. In this system inequality widened again (although economists still debate how to parcel out the blame between technological change and globalisation, as China and other countries took a full part in trade). Growth was slower than in the Bretton Woods era but inflation was reined in. Monetary measures replaced fiscal ones as the main policy tool. This era suffered its defining crisis in 2007-08 and has come to an end. The final years of both periods were marked by a degree of monetary experimentation. In the late 1970s many policymakers were converted to the doctrine of monetarism—the idea that by setting a target for the growth of the money supply governments could control inflation (and that controlling inflation should be the main aim of their policies). But monetarism proved harder to implement than its proponents thought; the monetary targets behaved unpredictably. By the mid-1980s, monetarism had been quietly dropped. Since the 2008 crisis, monetary policy has had to be rethought again, with central banks grappling with the “zero bound” for interest rates. Their first move was to adopt quantitative easing, the purchase of assets to drive down longer-term borrowing costs. Some have since followed this up with negative rates on bank reserves. Financial-market trends have played out against the backdrop of these two policy eras. 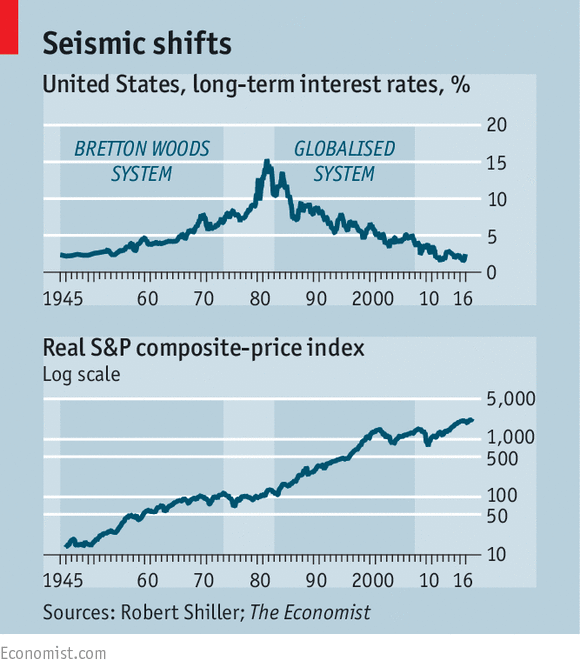 Equities did very well for 20 years under the Bretton Woods regime, but started to falter in the mid-1960s, well before the system’s collapse. Perhaps investors already took fright at signs of inflation; bond yields had been trending upwards since the end of the second world war. In the era of globalisation a great equity bull market began in 1982 but declined in 2000-02 with the bursting of the dotcom bubble. That was a portent of the bigger crisis of 2007-08. Both showed how investors could be prey to “irrational exuberance” and push asset prices to absurd levels. Just as rising bond yields in the 1960s presaged the inflationary battles of the 1970s, so falling bond yields in the 1990s and 2000s foreshadowed today’s struggles with deflation and slow growth. Financial markets seem to expect that political turmoil will indeed lead to another change of economic regime. Since the American election the MSCI World equity index has rallied and the Dow Jones Industrial Average has hit record highs. Valuations reflect this optimism. In the early 1980s price-earnings ratios were in single digits. In contrast, the S&P 500 now trades on an historic price-earnings ratio of 25. Another contrast with the 1980s is that, back then, short-term interest rates were at double-digit levels and equity valuations were able to climb as rates fell. That cannot happen now. So what kind of economic regime are investors expecting? They seem to be cherry-picking the best bits from the previous two regimes—the tax cuts and deregulation of the 1980s with an expectation that (as under Bretton Woods) fiscal, rather than monetary, policy will be used to smooth the ups and downs of the cycle. But the populist revolt is, in large part, a reaction against the free movement of capital and labour that has made so many financiers rich. A much bleaker outcome is possible, whereby rising nationalism leads to trade wars and an ageing workforce makes it impossible for the rich world to regain the growth rates of past decades. Change is coming. But rather than resembling the 1980s, the new regime could look more like the 1930s.